Washington, DC — On Tuesday, August 23, from 11:00 a.m. to 10:00 p.m., Chipotle Mexican Grill will host a Washington Humane Society-Washington Animal Rescue League (WHS-WARL) fundraiser across all downtown D.C., Bethesda, Rockville and Silver Spring Chipotle locations. 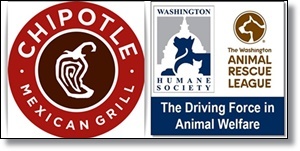 When customers dining at any of these locations mention the fundraiser at the register, Chipotle will donate 50 percent of the proceeds to the Washington Humane Society-Washington Animal Rescue League. Chipotle Mexican Grill to donate 50% of proceeds tomorrow to Washington Humane Society-Washington Animal Rescue League programs supporting homeless animals. WHEN: Tuesday, August 23, 2016, from 11:00 a.m. – 10:00 p.m.
Can't do lunch? You can always do dinner...Don't forget to mention the Fundraiser!